Former UFC welterweight title contender Rory MacDonald makes his long-awaited debut at Bellator 179 on Friday, challenging Paul Daley in the main event in London. The winner will be crowned the No. 1 contender for the welterweight title. But MacDonald’s story is about more than pursuing Bellator gold, as he’s one of a growing number of fighters moving from the UFC to Bellator. The UFC’s deal with Reebok, which prevents fighters from wearing sponsors logos, curbed a major source of income and curtailed some of the fighter’s personalities. Chuck Lidell and his famous icicle shorts. Tito Ortiz and fire. Those are two prime examples. Since Benson Henderson defected to Bellator in early 2016, free agency entered the MMA landscape. Fighters began to test the waters and explore other potential deals from different promotions. MacDonald was the first truly big name to make the shift: a fighter in his prime one fight removed from challenging for the UFC title and a top-5 contender jumping to the rival promotion. “It feels like chapter three of my career at this point, a big organization move,” MacDonald said. “Coming off the two losses I’ve had, the changes I’ve made in my training, I’ve noticed a big difference in mindset. MacDonald hasn’t fought in 11 months, and has stepped in the octagon just twice since 2014, taking his time to recover from various injuries incurred in two brutal fights: a loss to then welterweight champion Robbie Lawler in July, 2015 and a five-round war with title contender Stephen Thompson in June, 2016. Daley, sitting at 4-1 in his last five fights in Bellator, including an incredible flying knee knockout of Brennan Ward, isn’t a tuneup fight for MacDonald. Daley presents a chance for MacDonald to get into the title mix immediately. British welterweight Michael “Venom” Page is a burgeoning superstar. His in-cage showmanship is his main selling point, and his Pokemon celebration went viral. Unfortunately, a knee injury will remove Page from the London card. It’s a significant loss. If Daley-MacDonald gave MMA fans the credible fight between top contenders they hoped for, MVP gave casual fans the showmanship and highlight-reel clips they crave. On Friday at Titan FC 44, Jose “Shorty” Torres steps into the cage to challenge Farkhad Sharipov for the bantamweight title. Already the flyweight champion, Torres has the chance to be crowned champion in two weight classes, a feat which would hopefully punch his ticket to the UFC. This carrot has been dangled in front of Torres before. He had an extensive amateur career, where he went 25-1 and garnered several world titles along the way. Torres thought winning the flyweight title could be enough to land a contract with the UFC. At his last fight, Titan FC COO Lex McMahon called UFC president Dana White from the cage to get the ball rolling. With a win, Torres will improve to 5-0. A couple of potential fights for flyweight champion Demetrious Johnson currently exist in the UFC, Ray Borg and Sergio Pettis specifically. Bringing in Torres now could give him the opportunity to extend his undefeated record and put him in position to contend for the title in the next couple of years. 1. Was Herb Dean's call, no contest, the right call at the end of Dustin Poirier-Eddie Alvarez fight at UFC 211? Herb Dean is probably the best referee in the sport because of his keen eye and MMA fighting experience, but he was clearly wrong here. There is nothing "accidental" about a fighter throwing and connecting with three consecutive illegal strikes. The fact that those three illegal strikes from Alvarez ended up incapacitating Poirier makes it an open-and-shut case for Poirier earning a win by disqualification. Dean's reasoning for his decision, given after the fight, is more than a bit problematic. He has said that he didn't think Alvarez's illegal blows were intentional because Alvarez was "not trying to be a bad guy." First, intentionality used in this way delves awfully close into the realm of thought crime. Unintentional and accidental with regards to illegal blows should be reserved for situations like when fighter A. begins to throw a knee at an upright opponent and after that strike has begun to be thrown, fighter B. changes levels, drops to a knee to shoot in for a takedown and then gets hit with said knee strike while downed. Or, when a grounded fighter is being punched to a part of their head that is legal to hit but then turns and gives up the back of their head for contact while their opponent is in mid-swing. In such instances, the illegality of the blows can be rightly construed as "accidental," or "unintentional." Those are completely different situations than what happened in Poirier vs. Alvarez, and then what Dean used as his justification. With all due respect to Dean, and understanding that perhaps his words in his justification were more imprecise than he wanted, it is absurd to claim that a fighter should only be penalized or disqualified if a referee can somehow magically discern if a fighter is "'trying to be a bad guy," or whatever that means. 2. Dana White promised Demian Maia a title shot against Tyron Woodley. Will this fight actually happen, and is it the good matchup for Woodley that he thinks it is? I don't know if it will happen since Dana White's promises fly away with the most gentle of breezes and since Tyron Woodley is clearly saying he doesn't want to fight Maia, but it should. I see where Woodley is coming from - he feels that Maia can't take him down and if the Brazilian can't do that, things will get ugly, fast, in favor of Woodley. However, I wouldn't bet against Maia being able to take Woodley down. Maia has taken down better wrestlers than Woodley before, so he very well could control the champ. 3. There were several fracases at the UFC Summer Kickoff press conference. Are these good for the sport? As long as we're making fighters face-off, I'll never be mad at those fighters bringing some reality, heat or any form of entertainment to those moments. Though I don't relish the risk of real injury presented in situations like Chiesa charging Kevin Lee, I don't like the artifice of saying things can never get physical outside of the cage while a promotion milks those types of confrontations. 4. At UFC 211, Stipe Miocic and Joanna Jedrzejczyk successfully defended their titles. Who was more impressive? Impossible choice! If cornered, however, I'll go with Joanna, if only because she had to do what she did for many more rounds and minutes against a very game and dangerous opponent. 5. There’s talk of Miocic boxing Anthony Joshua. Want to see it? If in MMA, sure! I don't like to see MMA fighters and other combat sports athletes take one another on in anything other than in MMA because it is under those liberalized rules that we can find out who the better fighter, in real life, is. No MMA fighter has a great shot at beating a champion boxer in boxing, and no champ boxer has a great chance at beating an MMA fighter in a real fight. MMA bouts are closer to real fights, so I prefer watching MMA if I had to choose. In an interview with Sports Illustrated’s Jon Wertheim, flyweight champion Demetrious Johnson broached the topic of a superfight at 135 pounds. Johnson said he is interested, but at a specific dollar amount. “I'm not looking for an extra $100,000, $200,000. I want a seven-figure payday guaranteed,” Johnson said. Johnson laments the drama fighters bring about looking to sell pay-per-views and increase their payday. There is an underlying point to Johnson’s thought process, which he has verbalized: the most talented athlete in the sport gets paid less than others, unlike other sports. Johnson also discusses Ronda Rousey’s mentality, his pursuit of UFC history and more in a worthwhile read. 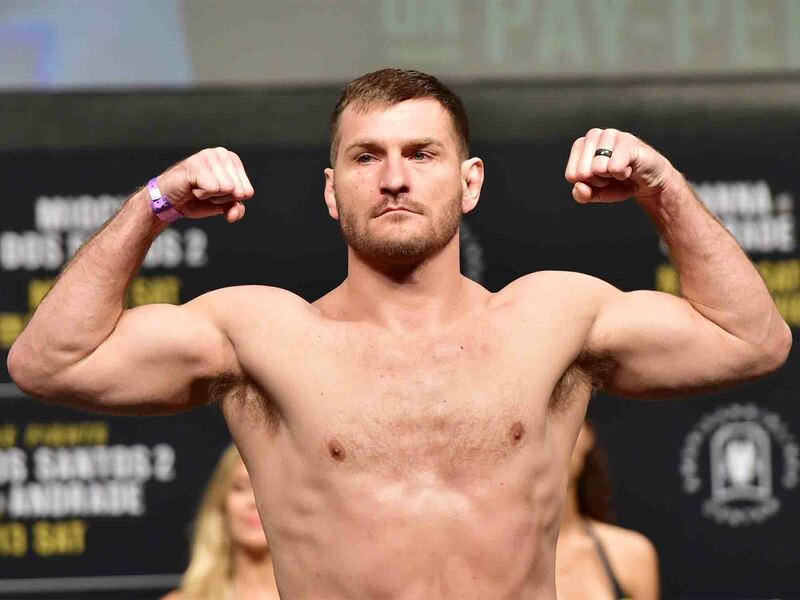 In the main event, heavyweight champion Stipe Miocic defeated Junior dos Santos to tie the record for title defenses, albeit at a whopping two. In his next title fight, however, Miocic can become the first heavyweight champion to defend the title three times, which would be an historic achievement. “I really don’t care. If I keep winning I’ll break history, big deal,” Miocic said at the postfight press conference. His comments were in the immediate aftermath of the win, but leading into his next fight the topic will be unavoidable and he’d be wise to embrace the notion. In the co-main event, Joanna Jedrzejczyk won her fifth title defense and is looking to tie Ronda Rousey’s record for title defenses in her next bout. “I feel like I step on different level and I’m moving forward,” Jedrzejczyk said before declaring UFC 211 her best performance. If Jedrzejczyk ties and then beats Rousey’s record in the next couple of fights, she is also determined to blaze a trail by becoming the first woman to win belts in two different weight classes, potentially simultaneously. “I have bigger and bigger goals and dreams,” Jedrzejczyk said at open workouts. “If I will not win the second belt, nothing is going to happen because like I said, I already reached my goals and dreams, but there is something better coming. Where does Yair Rodriguez go from here? Yair Rodriguez had his moment to break out at UFC 211 and ran into a buzzsaw in the form of veteran Frankie Edgar. The fight ended between the second and third rounds after doctors called it because of damage to Rodriguez’s left eye. While this fight didn’t catapult Rodriguez into the title picture, it proved he can be a star. The fight arguably had the biggest response from the crowd, whether rooting for Rodriguez or Edgar. His popularity was evident. Fortunately for Rodriguez, he is young, not even 25 yet. He can learn from this, build a win streak again soon and work his way toward a title shot. Rodriguez doesn’t want to fight Ricardo Lamas or Cub Swanson since they’re friends, and interim champion Max Holloway is fighting Jose Aldo in a title unification bout. Chan Sung Jung, the Korean Zombie, is booked against Lamas. That leaves the bottom half of the top-10 for Rodriguez. A fight against No. 10 Dennis Bermudez, who is also coming off a loss, could be an intriguing matchup. Major League Baseball, the sport most resistant to change, has embraced instant replay and it’s time the UFC followed suit. In the main event of the FX portion of UFC 211, the bout between Dustin Poirier and former lightweight champion Eddie Alvarez ended in a no-contest after illegal knees from Alvarez. Since Poirier had a knee on the ground, the result should’ve been a disqualification, and Poirier is appealing the decision, albeit in an effort to get his win bonus from the UFC. “Those were illegal moves. That should be a disqualification for Alvarez and a win for Poirier,” FOX analyst and former fighter Brian Stann said. “Here’s the frustration: We set new rules, but we rarely use them. We go to different cities every week and the fighters have no idea what knees are allowed or what point scores we’re going by. Not all state athletic commissions, including the one in Texas, have embraced the new unified rules yet. But instant replay could at the very least make sure the call is correct. Former UFC CEO Lorenzo Fertitta even reached out to UFC president Dana White to demand instant replay. When it comes to all things MMA, the pressure is on the UFC to implement change. It led the charge to bring MMA back to New York, and the UFC will need to lead the charge in getting MMA to embrace instant replay.